Solutions for Acer eRecovery Management problem - Acer eRecovery Management cannot select restore type. When I bought 3 Acer Aspire REVO about 4 years ago, I made sure to create the recovery DVDs, because I knew I was going to wipe the drives and install Windows XP instead (they came pre-loaded with VISTA). Now, those computers are outdated and need to be sent for resale. I securely erased the drives, connected an external DVD drive, and booted from the first recovery disk. When the eRecovery Management screen shows up, I'm asked to "Select Restore Type". -> Exit >> The only option that I can click on. So, the problem is that acer erecovery management cannot select restore type. I have my daughter's Acer 4820T laptop running Windows 7 Home Premium with 4GB DDR3 memory. The original HD failed, and I had to purchase the eRecovery media from Acer as she had not created them when it was working fine. I installed the new HD a 500GB Seagate, but when I run the eRecovery, I am able to choose the UI Language, and on the next screen where the choice of recovery options appear, the only one of the 3 options available is Exit. Both the Restore to Factory Settings and the Restore OS Saving Data options are grayed out. Acer eRecovery Management cannot select restore type. The recovery discs may be damaged. So, replace them with good ones. The original hard drive needs to be formatted, or needs to be free of partition. 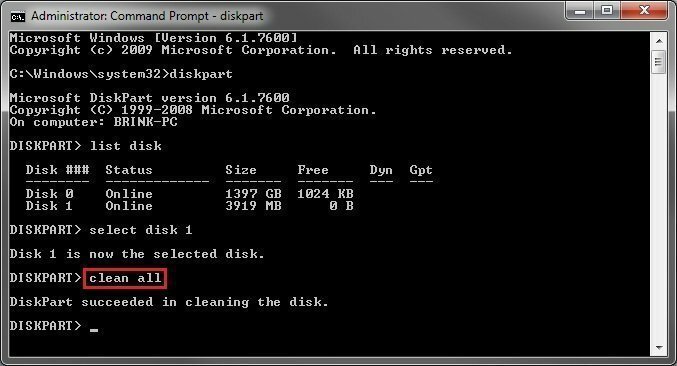 Frist format the system disk by wiping the HD first with Diskpart Clean Command: diskpart (administrator privilege) > “list disk” > “select disk #” > “clean all” (delete data) or “clean” (erase data forever). Then, partition the drive with one partition formatted NTFS. Continue in the above diskpart with: “create partition primary” > “format fs=ntfs” > “exit”. Tip:Try it in both AHCI and IDE mode. Then, the above acer erecovery management problem should be solved. Disable AHCI in BIOS and try again. As for above Acer eRecovery error, you may also check the RAM in the system. It's #3 on the list as it's a remote possibility. Try Acer eRecovery Management alternative – AOMEI OneKey Recovery. AOMEI OneKey Recovery is a third party software professional in system backup and restore. When your system fails, you can make use of it to quickly recover your os back.